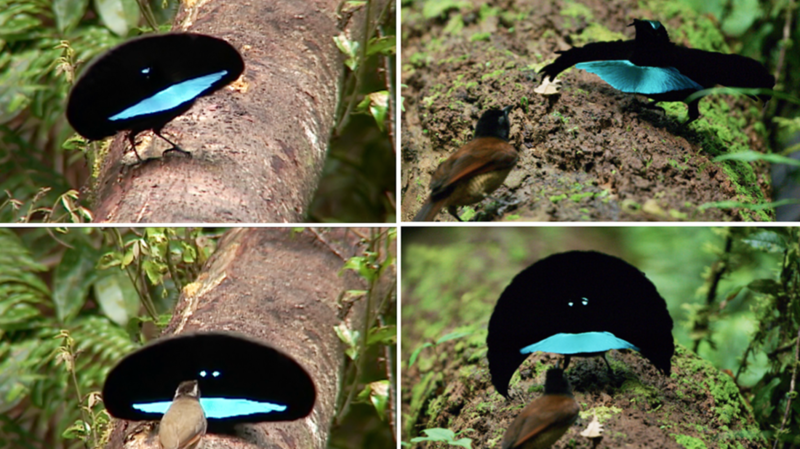 The courtship displays of the superb bird-of-paradise may be some of the strangest in the world—the bird seemingly transforms into a bouncing, fuzzy black ball with iridescent blue "eyes" and "mouth" that appear to glow. While the bird was long thought to be a single species, researchers from the Cornell Lab of Ornithology and Harvard Museum of Comparative Zoology recently identified a new species, the Vogelkop superb bird-of-paradise (named for the region of New Guinea where it's found). The Vogelkop superb bird-of-paradise has different courtship calls, different-looking females, and a slightly different (but no less weird) courtship dance. Both species sport some killer dance moves when they transform—you can check out more in the video from the Cornell Lab of Ornithology below.